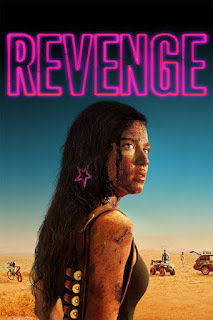 Hell hath no fury like a woman with a pump action shotgun in Coralie Fargeat's vigilante thriller REVENGE which is out on Digital this month. Jen (Matilda Lutz - Rings) is taken away by her boss Richard (Kevin Janssens - TV's Salamander) for a dirty weekend at his remote luxury condo, which happens to be on the edge of a desert. But when a couple of his friends, who he'd planned a hunting trip with, show up early and the booze and drugs start flowing. Things quickly get out of hand once Richard's back is turned. When Jen threatens to expose their affair if he doesn't do something about them, he decides instead that its easier to silence Jen. But despite suffering terrible injuries, she manages to escape and a dangerous game of cat and mouse ensues accross the desert. Owing more than just a passing nod to I Spit on Your Grave, though not as explicit, REVENGE is an exceptionally gritty and brutal shocker bound to leave audiences squirming in places. Matilda Lutz, who seems to spend most of the film in a crop-top and thong, whilst bagged down with shotguns and cartridge belts, was certainly very easy on the eye, despite being covered in blood and dirt for the most part. Only negative thing I would say is that whilst most of the film is in English, much of the dialogue between the 3 male leads is in French. So I found the constant switching between English and French throughout the film somewhat distracting. Also, many would point out that in reality, the injuries the female lead would have undoubtedly sustained would have prevented her transformation into this "John Rambo" type character she becomes. But these criticisms aside, I still really enjoyed this and cult movie fans should love it. REVENGE is released in the UK digitally from September 7th. DOWN A DARK HALL comes to UK DVD and Digital Oct.
FILMFEAR Manchester - Programme announced!